Chef/owner Dante de Magistris' flair for the Mediterranean shines at this waterfront restaurant that overlooks the Charles River. 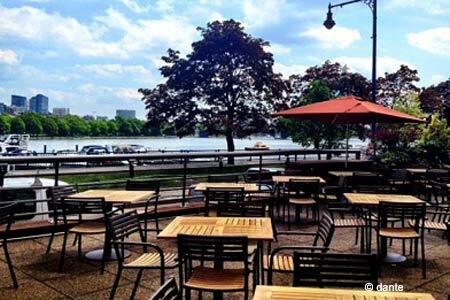 : Inside the modern art-filled restaurant, which offers spectacular views of the Charles River, there are two dining rooms, two bars, a lounge with a DJ-ready sound system, a patio overlooking the Charles and even a private balcony, where dinner is served nightly. When dining al fresco, be sure to request a seasonal cocktail, such as those “from the garden,” which may include acai vodka, Fernet Branca, Chambord and mint, or the Basilicata made with vodka, raspberry and fresh basil. Seafood selections range from tomato-braised tripe and charred octopus to pan-roasted Gloucester blue cod. Homemade pastas and gnocchis provide added comfort. Don’t miss chef Dante de Magistris’ signature “semplice” salad---simple greens paired with creamy cucumber yogurt and sweet grappa raisins, topped off with a red wine vinaigrette---before moving on to the veal porterhouse with mustard greens. The wine list hails predominantly from Italy but there are some surprise selections from France, Germany and Spain. The bar offers $1 oysters daily from 4 p.m. to 6 p.m. and a weekly grilled cheese for $2. If you’re in the suburbs, try de Magistris’ sister restaurant, an Italian trattoria, Il Casale, in his hometown of Belmont.